Tonopah Springs, later the site of one of the richest booms in the West, was an Indian campground for many years, long before Jim Butler spent a chilly night here. A number of stories exist as to how Butler discovered the ore. The most popular version is that Butler’s mule wandered away and when Butler found the ornery critter, he noticed an outcropping that appeared to be heavily laced with silver. Butler took a number of samples. The date was May 19, 1900. This quiet start belied the actual importance of the discovery. Butler firmly believed he had discovered an important silver deposit but he had trouble convincing the assayer he visited in nearby Klondike. The assayer told him the samples were worthless, consisting mainly of iron, and he threw them into the back of his tent. Butler was still convinced that his find was genuine. On his way back to his Monitor Valley ranch, he stopped at Tonopah Springs once more to gather samples. Back at his ranch, Butler put the samples on his windowsill. Not too much time passed before Tasker Oddie, later to be governor of Nevada, stopped at the ranch and spied the ore samples. He offered to pay for another assay and Butler agreed to this. Butler, in turn, offered Oddie a quarter interest of the assay. Oddie heartily agreed. He took the ore samples to William Gayhart, an Austin assayer, and offered Gayhart a quarter interest in his quarter. Gayhart found the assay ran as high as $600 a ton. When Oddie was notified of the value of the samples, he immediately sent an Indian runner to Butler’s ranch to alert him of the rich find. Butler did not react rapidly. He stayed at his ranch to complete the hay harvest and did not even bother to file claims on the lode site! News of the discovery traveled to Klondike and soon, scores of eager prospectors were searching around Tonopah Springs, to no avail, for Butler’s lode. Butler finally went to Belmont, and on August 27, 1900, he and his wife filed on eight claims near the springs. Six of these – Desert Queen, Burro, Valley View, Silver Top, Buckboard, and Mizpah – turned into some of the biggest producers the state has ever had. Work was begun on the Mizpah mine in October 1900, and a camp called Butler formed nearby. On Christmas Day, 1900, 14 men were living in the camp including Butler and Tasker Oddie, Nye County’s new District Attorney. Butler decided to lease out all of his claims for one year, from December 1900, to December 1901. Soon, the cry of “Jim, how about a lease?” was heard throughout the bustling camp. Oddie and Butler were partners, receiving a 25% royalty on all gold and silver mined from the Butler claims. 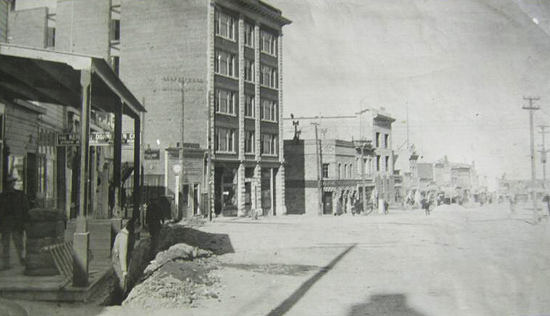 The town of Butler began to grow by leaps and bounds. By January 1901, there were 40 men in the camp. The first stagecoach, coming from Sodaville, arrived in Butler on March 24, 1901, with seven passengers. It was a two day trip, with an overnight stay at Crow Springs. The camp consisted of seven shacks, a number of tents and a population of 60. Within weeks, the population had grown to 250. A post office (Willie Sinclair, postmaster), named Butler, opened at the booming camp on April 10, 1901. It was not until March 3, 1905, that the post office changed its name to Tonopah. 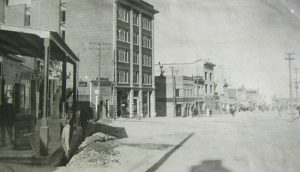 By the summer of 1901, Butler was beginning to make its mark on Nevada’s silver production figures. The mines around the town produced almost $750,000 in gold and silver in 1901, and for the next 40 years, the Tonopah mines were consistent producers. The town now had six saloons, restaurants, assay offices, lodging houses, a number of doctors, lawyers and a rapidly swelling population of 650. The first wedding took place on November 14 when Harry Stimler and Eleanor Whitford were married. A newspaper came to the town on June 15, 1901, when W.W. Booth, who had published a paper in Belmont, set up the Tonopah Bonanza. The first issue had this greeting: “With this issue, the Tonopah Bonanza glides down the typographical ways and into the sea of journalism. Whether its voyage will be a calm and prosperous one, time along will tell. The Bonanza will at all times act as a free lance, giving credit whenever merited and censure when called for. Our policy in politics will be for the best of the country. That the paper will meet with public favor or condemnation is left to the opinion of the reader and advertiser. We have done our best and sincerely hope it will meet with your approval.” The paper listed Butler as its place of publication until March 1905. Booth took over the postmaster duties from Sinclair and served until 1905. 1902 was also very prosperous for the booming town. Jim Butler had sold out the claims, which were all consolidated and gave birth to a new company, the Tonopah Mining Company. It was incorporated in Delaware, with stock listed on both the Philadelphia and San Francisco exchanges. The company, with J.H. Whiteman as president, controlled 160 acres of mineral-bearing ground around the Tonopah district. The company also had holdings in the Tonopah-Goldfield Railroad and controlled mining companies in Colorado, Canada, California and Nicaragua. The mine workings at Tonopah consisted of three deep shafts with more than 46 miles of lateral workings. The deepest of the three shafts was 1,500′. The ore mined at the site was shipped to Millers, where it was treated in a 100-stamp mill. 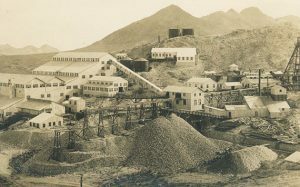 This facility was used by the company’s mines until suitable treatment facilities were built at Tonopah. The Tonopah-Belmont Mining Company was also formed in 1902. Tonopah Belmont Extension MineThe company was based in New Jersey and had C.A. Heller as president. The company’s property, 11 claims covering more than 160 acres, was on the east side of the property owned by the Tonopah Mining Company. There were two deep vertical shafts, 1,200′ and 1,700′, with workings covering almost 39 miles. The company also had to ship its ore to Millers until 1912, when its own 60-stamp mill was built at Tonopah. The mill had a capacity of 500 tons. During its years of activity, 1912-1923, it was regarded as one of the country’s best equipped and most efficient silver cyanide mills. 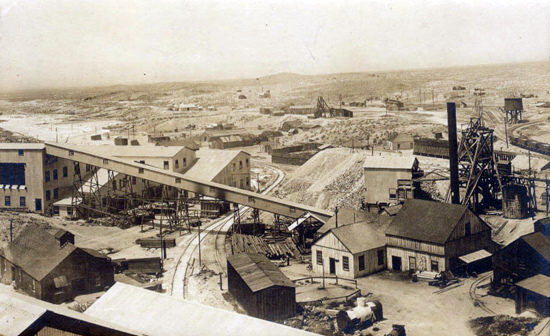 Tonopah’s mines maintained very high yearly production until the Depression brought a slowdown. Mine production from 1900 to 1921, the peak years, was almost $121 million. The biggest single year was 1913, when almost $10 million in gold, silver, copper and lead was mined. By World War II, only four major mining companies were operating. A huge fire in October 1942 destroyed the Tonopah Extension mill and property, and spread to a nearby hotel, causing $100,000 in damage. At the end of the war, even these companies had left. The final blow came in 1947 when the Tonopah and Goldfield Railroad folded and its rails were torn up. Not much mining activity has taken place in Tonopah since then. In 1968, Howard Hughes and his Summa Corporation bought 100 claims in Tonopah, including the Mizpah, Silver Top, and Desert Queen mines. Hopes for a mining revival soon faded after core samples and nothing more were taken. A few of the old mines were re-timbered but never reopened. As of now, total production from the Tonopah district is just more than $150 million, a figure few other places could boast.